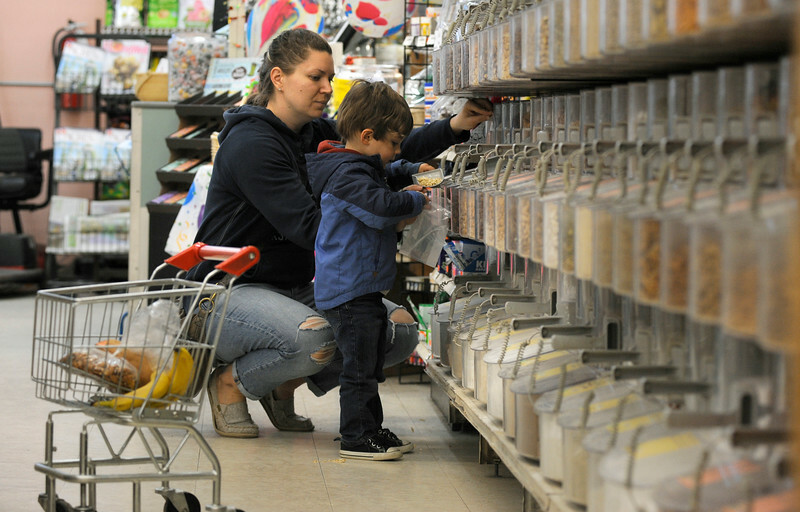 Bangor, ME — April 20, 2017 — Frank Ossinger,3, of Hermon, gets a bag of bulk food at the Natural Living Center on Thursday while shopping with his mom, Gabby. The Ossinger family has been shopping at The Natural Living Center for more than twenty years. Owned by Bill and Barbara Geiger, the store that opened on April 7, 1977 as a kiosk in the Airport Mall, is celebrating its 40th anniversary. Before local, farm to table and organic were commonly used words, the Natural Living Center was supplying the Bangor area with just those things.